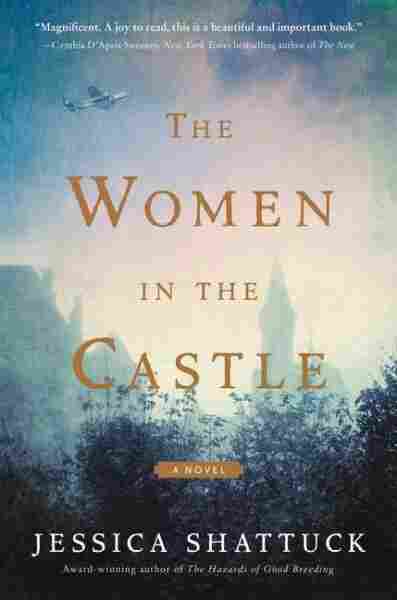 These 'Women In The Castle' Provide New Perspectives On Nazi Germany Jessica Shattuck's novel follows three German women — all war widows, and all of very different political persuasions — who take refuge in a ruined Bavarian castle at the end of World War II. The Women in the Castle, the new novel by Jessica Shattuck, tells the story of three women, and their children, who take refuge in the ruins of a Bavarian castle at the end of World War II. The women are war widows — war resistance widows, really — whose husbands paid with their lives for the July 1944 plot against Adolf Hitler. Marianne von Lingenfels has promised those who conspired with her husband that she would find and protect their families. But the support they give one another is tinged with regrets and guilt about their different pasts, and set against a deprivation for which the world has little sympathy. Shattuck says the story has its roots in her childhood. "My mother was German, so I grew up going to visit my grandparents in the summers, and I also grew up with a very strong sense of shame about being half German. ... I loved going there and I loved my grandparents, but I also knew there was a very dark history, and I felt very conflicted about that." I loved to look at the old photo albums with my grandmother, and at some point we came across some pictures of my grandfather in Nazi uniform, and suddenly I had a whole different sense of what they had been a part of. I knew they had led these kind of agricultural youth programs, but seeing that he was wearing a Nazi uniform while leading the programs really drove home the point that their "ordinary German" experience was that of Nazis. In the case of these three characters, they're very different, and they really span the different ends of the political experience of Germany at that time, because Marianne is a true resister, who very early on saw what was happening in Germany around her, and recognized the evil that was transpiring as it unfolded. And then on the other hand, there's Benita, who was fairly apolitical, and Ania, the third character, she allowed me to really explore the experience of someone who's truly enamored of the Nazis in the beginning. What I felt was really relevant when I was writing this book was the question of, what did ordinary Germans ... experience during that time, and how did they let this happen? What I felt was really relevant when I was writing this book was the question of, what did ordinary Germans — the people whose lives sort of touched very peripherally on the darkness — experience during that time, and how did they let this happen? How did they either not see it, or blind themselves to it? It felt to me like those questions are becoming more and more pertinent in America, and there was very little written about them as I started to investigate what other books were out there. The lens through which we see the Holocaust and World War II is so often the very important lens of the victims' perspective and the perspective of the Allies and the liberators — but then, I feel like now that that has become part of our canon, we can also step back and start thinking how, and starting to look at the German experience, the experience of the complicit and the enablers. Editor Barrie Hardymon, producer Samantha Balaban and web producer Petra Mayer contributed to this story.